My Caramel-Brorst Polanskified Terrafirmatrically Solanderizised Radiotopicallyistic Flummery 73rd Sail was on a beautiful autumn afternoon on Upper Narragansett Bay. My 73rd Laser sailing day of 2008 as sponsored by... those guys. I can't be bothered to write out the full name again. What's the deal with these weird sponsor names? Is it supposed to be funny or something? Well that guy called "anonymous" who is always leaving comments here suggested a couple of weeks ago that I ought to do more marketing of my quest to sail 100 days in a year and should secure some sponsorship. A bit like Reid Stowe and his 1000 Days at Sea. He has sponsors doesn't he? Yeah, but you're not fooling anybody. We all know you are just pretending to have sponsors. They are just made up names. What's the point? Point? Does everything have to have a point? Blogging is all totally pointless. Well, the first two sponsors were pretty obvious weren't they? The makers of my sunglasses on a day of amazing visibility. And then being inspired by John McCain's "I have a pen" speech. I don't like it when you get political. 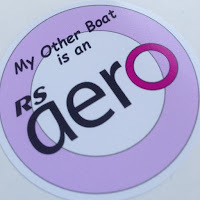 I thought this was supposed to be a sailing blog. However did you get that idea? I don't know. But I did know those two sponsors that you stole from TV shows, Dunder Mifflin from The Office, and Sunshine Desserts from The Fall and Rise of Reginald Perrin. Stole? That's a bit harsh. But what was that weird one about flue gas desulfurization? I didn't get that. Aaaah. That was a test. To see if people who followed Laser sailing, or for that matter Olympic sailing in general, ever noticed who was sponsoring the sailors. You're not going to tell me that an Olympic Laser Sailor was sponsored by Oglebay Norton Flue Gas Desulfurization, are you? That's Anna Tunnicliffe. 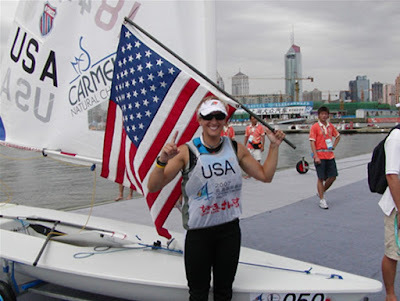 She won the Laser Radial gold medal in China. So what? Who was her main sponsor? I dunno. I think it says Carmeuse on her sail. Don't have a clue? Who cares? Well, I guess Carmeuse cares. If a company sponsors an Olympic sailor don't you think the company would want the world to notice who they are and perhaps have some idea what they do? Yes. Check out the Carmeuse website. They are a lime and limestone producer. And the first application listed for their products on that web page is Flue Gas Desulfurization. And last year they bought another company in that field, Oglebay Norton. So all those people making fun of you for having Oglebay Norton Flue Gas Desulfurization as a "sponsor" were actually laughing at Anna's main sponsor? I wouldn't say that. Anna is a real Laser sailor. And she has earned the respect of the whole sailing world with her accomplishments. I'll pay that one! hahahahaaa! 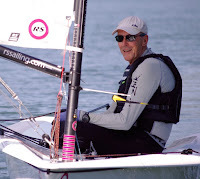 TMan, your "Days of Laser Sailing" Blogs are turning into something akin to a cryptic crossword...excellent...I can't wait for the next one! Quite a yarn. And, as usual, masterfully told. Apologies for being one who thought you might be having a cannabinoid moment. But, that's pretty much just corporate PR happy talk. Wouldn't your readers like to know the real reason?